… It’s nice to find a well researched and articulate book that gives voice to the confusion and bewilderment I have experienced watching political discourse and activity over the past couple of years in this country, especially since Obama was elected. I have had so many WTF moments, incredulous that what was happening in the regular course of government was actually happening. The faux debt crisis, for me, was the straw that broke the camel’s back, the one where I seriously thought Republicans were committing treason. Their actions and positions last summer were so obviously motivated by party-wide self advancement, rather than the good of the country they were elected and paid to serve, that I felt they should have been taken out back and summarily shot. This book clearly takes the position that our government, with pure partisan politics at the center, is dysfunctional, with the possibility that if something is not done, it will “get worse”. The culprits are the current Republican party, which the authors term an “outlier” in party politics, with a take-no-prisoners attitude. They don’t care what happens to the country, believing that to save the beast they must first kill it. This is radical ideology at its core, blind to its ramifications, designed to make the country hate the government in power so badly that we will “throw the bums out”, allowing them to effortlessly move into the political vacuum created by the anger they incited. It’s insidious. For instance, they have made it known since the first day of the current administration that their sole purpose as legislators is to “make sure Obama is a one term President”. That was my first WTF moment. Isn’t it their job to work with the president to legislate in a way that is beneficial for the country, regardless of political difference after the elections? Isn’t that what we elected them to do? Isn’t that what they receive a paycheck (not to mention some very nice perks) to do? They also have taken a monolithic stand to defeat anything that Obama favors – even if it means voting against legislation that they originally proposed! The authors call this “acting as a parliamentary majority” as occurs in other countries, when the entire party votes as a block. This works OK in countries with more than one party, but in a two party system, it effectively give power to the minority. Isn’t that a good example of institutional insanity? Doesn’t it mean, by it’s very nature, that the good of the country has taken a back seat to partisan politics? At least in the past, when Republicans opposed Democrats, or vice versa, we knew that they did so because they had an honest, good-faith problem with the underlying legislation. But to vote against legislation you know may be beneficial to the country, that they originally proposed, simply because the president has acted in a bi-partisan, moderating manner and embraced it, is just plain, nuckin’ futz! And possibly even treasonous. Doesn’t the act of taking a legislative position contrary to what you agree is proper, for the sole purpose of making the current head of state look bad, with a goal to defeating him at re-election time, border on the treasonous, under any definition of the word? The authors, two normally conservative members of established Washington think tanks, do a very nice job of relating the history, starting in the 1970s, progressing through the Reagan years and highlighting the nefarious plan of Newt Gingrich to move the Republican Party to prominence, ending with the current politics of stalemate now being practiced in Washington. They give example after example of the obstructive, yet irrational nature of the current Republican plan (one they find highly dangerous to the stability of the country). But they don’t stop there. They then put forth multiple suggestions for stopping and restructuring the political process to get us back on a two party system that actually works in a robust, albeit oppositional manner for the betterment of the country. According to them, there is no single bromide that will correct the problem. Campaign reform, party reform, the electorate’s attitude all must be tweaked to correct the two party system, which the authors, as lifetime observers, still maintain a high regard for, despite these problems. I’m not so sure. It seems to me that many of the solutions depend on Congress to enact legislation, or voluntarily step back from some of the current practices, and I have my doubts that they would do so. Constitutional Amendments, even legislation requires a lot of cooperation, the dearth of which we are trying to correct. Getting the Supreme Court to reverse Citizens United, a major problem as the authors see it, would require a significant change to the current line-up of Justices, which requires death or resignations, and appointments of new Justices. If Romney wins this election, which is highly probable, given the money that’s being funneled into his campaign, (the like of which we will not appreciate until the election is over), any new Justices will probably not be favorable to overruling Citizens United. It’s a Catch 22 if I’ve ever seen one. It’s even worse that it looks. Apparently, Mann and Ornstein were the “go to” guys for the Sunday talk show circuit, and well respected OP-Ed writers until this book was published. Now they are pariahs, ignored by all the talk shows (except Chris Hayes on MSNBC and John Stewart on the Daily Show). For that reason alone you should read this book. This entry was posted in 2000 election, 2008 Election, 2010 elections, 2012 Elections, Beliefs, Birther, Book Review, Constitution, Critical thinking, Cults, Current events, Economy, Fox News, George W. Bush, History, MSNBC, Obama, Occupy Wall Street (OWS), Political/Topical, Politics, Presidential Elections, Republicans and tagged Barack Obama, Beliefs, Citizens United, Constitution, Constitutional amendment, elections, First Amendment, Fox News, George W. Bush, Goodreads, Intelligence, Newt Gingrich, Norman J. Ornstein, Obama, Politics, Republican, Republicans, Thomas E. Mann, United States, WASHINGTON. Bookmark the permalink. I think I want to read this book. But I’m afraid it will send me into a state of severe depression. 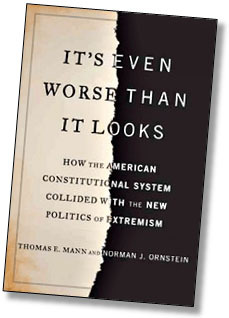 Mann and Ornstein’s book was recently included on the Project On Government Oversight’s “15 Books That Matter” summer reading list. For those interested in these sorts of good governance issues, the full list is here: http://getinvolved.pogo.org/site/PageNavigator/books_that_matter_summer_2012_reading.html. The United States is widely considered a two-party system. Since the birth of the republic a conservative (such as the Republican Party ) and liberal (such as the Democratic Party ) party have usually been the status quo within American politics, with some exception. Third parties often receive little support and are not often the victors in many races. Despite this, there have been several examples of third parties siphoning votes from major parties that were expected to win (such as Theodore Roosevelt in the election of 1912 , George Wallace in the election of 1968 and Ross Perot in the election of 1992 ).